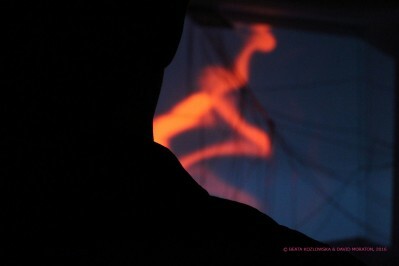 Theatre of colour and movement, is a collaborative project made in Toi Poneke Art Centre betweeen David Moraton and I. We are two artists who collaborate and join commonalities in our practices. Our collaboration revolves around the concept of interdependence as we are showing how two artists can fully blend and interrelate to create a combined artwork. The Project Theatre of colour and movement referencing early Modernist experiments with moving image (Moholy-Nagy), capturing the time and movement phenomena. In our experimental site specific art installation, we are going a step forward, by integrating the element of real time interactivity. 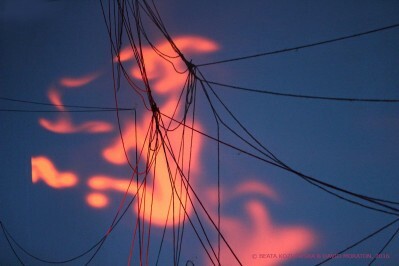 The site specific installation is consisted of black and red strings hanging and crossing from one side to the other, this time fully inter-connected. 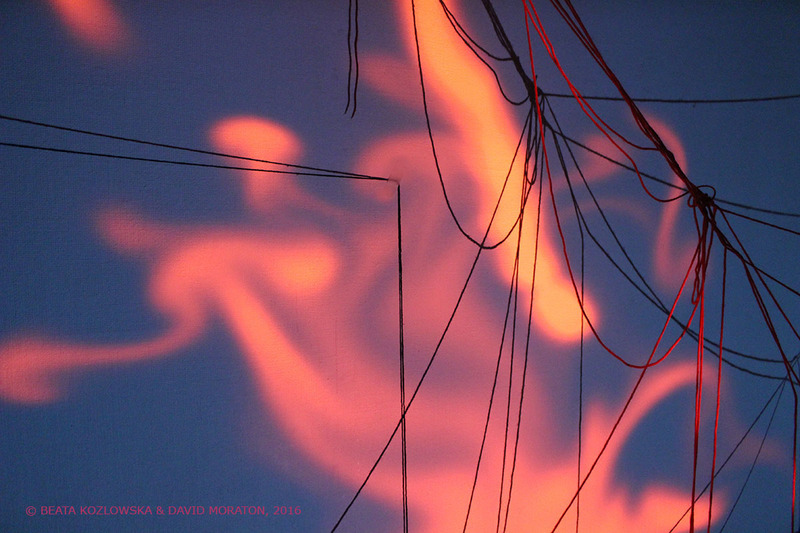 There is a stereoscopic projection of a video art piece that evolves depending on the spectator’s movements, creating flowing lines that run across the walls. The work flows in ever changing, glowing and fluctuating virtual substance, opening a space for performative gesture. In the ‘performative area’ all the elements actually interrelate and create a dialog in the frame of a different time-space configuration. On one hand, the video, with the help of the stereoscopic glasses, has its own three-dimensional essence, but it’s not actually real. It shows something that is not physical but seems to strive to have matter, weight, real volume and become an extension of the actual space. 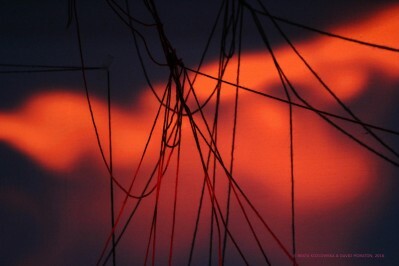 On the other hand, the black and red strings want to acquire the qualities of motion and fluidity present in the video, as if for a moment they could escape from their static physical nature and live in the video reality where they can flow and evolve. The interactivity is designed not only to bring a different sense of presence and timing into the experience but also to create an opening bridge between these two dimensions, as an action of the viewer in the real world immediately reflects on the virtual. The final meaning of this installation has to be constructed through the bodily experience of the individual spectator. This fully matches with Merleau-Ponty’s phenomenological theories approaching the concept of being as an existence: a body can be a medium and it is only the lived experience that unfolds in human consciousness. But it is important for us to disrupt the traditional closed semiotic boundaries, so there is no sole, fixed idea behind this work.